This effortlessly elegant maillot features a removable strap and a utility belt. This classic one-piece style cinches the waist, giving an ultra-feminine silhouette. 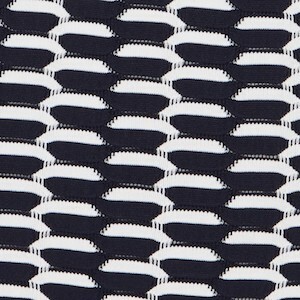 The Nathalie Maillot can be worn to bask by the pool or for everyday elegance when styled with a textured skirt or pant. This effortlessly elegant maillot features our premier Macro Tweed Jacquard on the exterior while the interior is fully lined with our Italian Eurojersey. The features on this suit offer versatility with a removable strap and a utility belt. This classic one-piece style cinches the waist, giving an ultra-feminine silhouette. The Nathalie Maillot can be worn to bask by the pool or for everyday elegance when styled with a textured skirt or pant. Runs true to size. For women with longer torsos, we recommend sizing up one size. Model is wearing a size small and has a 61" torso length.